Want to cuddle with Denise? Hi! I’m Denise. I’m an avid fan of cuddling. I believe that platonic touch is essential for health. Touch releases oxytocin, known as the “love hormone/cuddle chemical”, which reduces stress and anxiety and increases trust and relaxation…all much needed in today’s tech heavy, low touch environment. 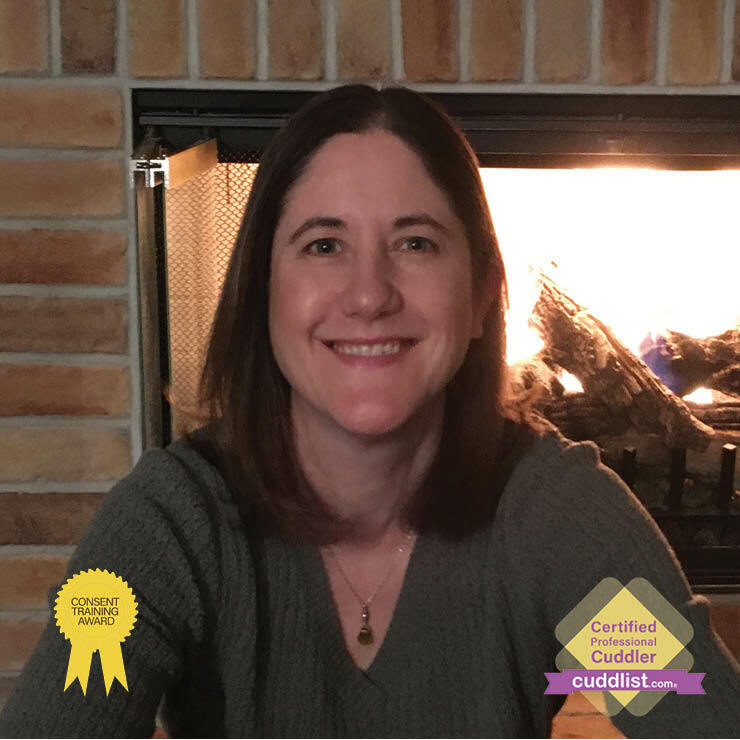 When I talk to others about being a Cuddlist, I usually begin with “What I do is kind of weird.” I think it’s best to put that out there up front. (You may not think it’s weird, but I’m originally from a small town in Montana…many people there would think it’s weird.) However, cuddling is also powerful and needed. It wasn’t long ago that therapeutic massage and meditation were viewed skeptically. Given time, I hope cuddling will reach the same level of enthusiasm and acceptance as meditation or massage. In our session together, there are limitless ways that we can cuddle. We can hold hands and talk or hug and just breathe. We can spoon, nap, watch a show, trade massages, or try our hands at the various snuggle positions in the Cuddle Sutra. It’s up to you. All cuddling is clothed and platonic. Communication and consent are an integral aspect of cuddling sessions so I will encourage you to share your wants. Most people are hesitant to ask for what they want so my goal is to create a welcoming space where you feel comfortable sharing with me. I will provide a nurturing environment without judgment where both laughter and tears are welcome. To learn more about my approach to cuddling, you can listen to a recent interview with Milwaukee Public Radio. See the link below. I like to speak/meet with all new clients prior to our first session. During our conversation, we will go over the Code of Conduct, get to know each other a bit and discuss what you hope to get from our session. I do out-calls for initial sessions, however in-calls are available for established clients. There are stairs to enter my location. (For those with a disability that would impede using stairs, I will travel to you. If the round trip is less than 1 hour, the travel fee will be waived.) For out-calls, there is a travel fee of $20 for up to an hour round trip; anything over that will be negotiated. Out-calls can take place in a variety of locations. I have held sessions at a client’s residence, work, a hotel, a park on a sunny day, even on a sailboat. I bring music, a comfy blanket and an open heart to all sessions.